FLAGSTAFF, Ariz.–(BUSINESS WIRE)–W. L. Gore & Associates, Inc. (Gore) today announced the first European patient implant of the GORE® EXCLUDER® Conformable AAA Endoprosthesis with ACTIVE CONTROL System. This next-generation endovascular aneurysm repair (EVAR) device is indicated to treat the broadest range of abdominal aortic aneurysms (AAA) in patients with challenging anatomies. Physicians now have an EVAR solution designed to treat patients previously excluded due to challenging proximal aortic necks. The GORE EXCLUDER Conformable AAA Endoprosthesis with ACTIVE CONTROL System is CE Mark approved for patients with proximal aortic neck angles of up to 90 degrees with a minimum 15 mm aortic neck length or in patients with proximal aortic neck angles of up to 60 degrees with a 10 mm minimum aortic neck length. The successful procedure took place on September 11 at Catharina Hospital in Eindhoven, Netherlands by Marc van Sambeek, MD. The patient was also the first enrollment in an investigator initiated post-market European registry, known as EXCeL (EXcluder Conformable real Life), of which Prof. van Sambeek is the principal investigator. The EXCeL registry will enroll 150 patients from up to 11 European sites. Data from the registry will assess safety and treatment success of the GORE EXCLUDER Conformable AAA Device for the treatment of infrarenal AAA in a broad range of anatomic presentations. The device is also currently being evaluated in a pivotal investigational U.S. study, in which the first patient was enrolled on December 19, 2017. The GORE EXCLUDER Conformable AAA Device builds on the proven clinical performance of the GORE® EXCLUDER® AAA Endoprosthesis, which represents over 20 years of worldwide experience and more than 300,000 patients treated*, a history unmatched by currently available AAA stent grafts. The new device leverages the limb design of the GORE EXCLUDER Device which has demonstrated exceptional clinical performance as evidenced by 0.5% limb occlusion through 3-year follow-up. ** The limbs, a unique combination of proprietary ePTFE graft material and a fully supported, nested, nitinol stent, are designed to prevent kinking and occlusion. 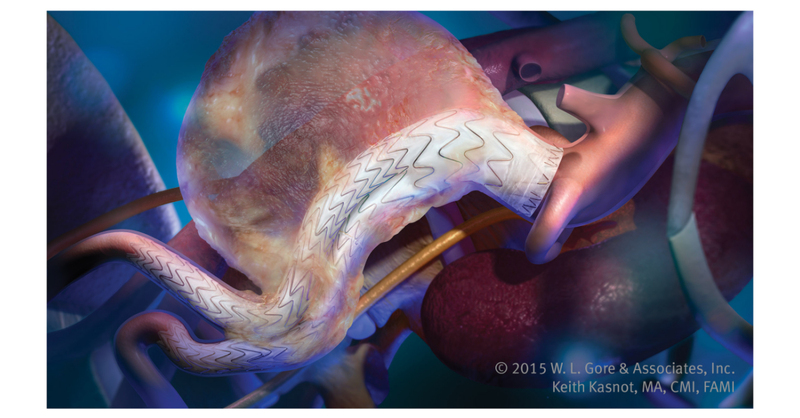 The new device introduces the GORE® ACTIVE CONTROL System in AAA treatment. This new delivery system includes a conformable stent graft, enhanced device positioning, and optional angulation control. To enhance positioning, the device is deployed partially constrained and the physician has the option to reconstrain the proximal end of the device to aide in achieving optimal device placement. During the deployment process, the physician may use the optional angulation control to angle the device to achieve orthogonal placement to the aortic blood flow lumen and to maximize device conformability and seal. The GORE EXCLUDER Conformable AAA Device is part of the growing family of endovascular products that share a mission to effectively treat aortic disease, backed by Gore’s highly rated clinical support team and educational offerings.† The comprehensive portfolio of products also includes the GORE® TAG® Conformable Thoracic Stent Graft with ACTIVE CONTROL System for the treatment of thoracic aneurysms, transections, and Type B dissections; the GORE® EXCLUDER® Iliac Branch Endoprosthesis, the first complete, all-in-one system approved in Europe for the endovascular treatment of common iliac artery aneurysms or aortoiliac aneurysms; and the GORE® VIABAHN® VBX Balloon Expandable Endoprosthesis for treatment of de novo or restenotic lesions, including lesions at the aortic bifurcation.